Moist Buttermilk Pumpkin Spice Bread is a richly spiced homemade pumpkin bread that gets its extra softness from the buttermilk, not oil. Published 8/24/16. Updated with new tips 9/1/18. I know, I know. It’s only August. Pumpkin spice everything season isn’t supposed to kick-off for another week or so. 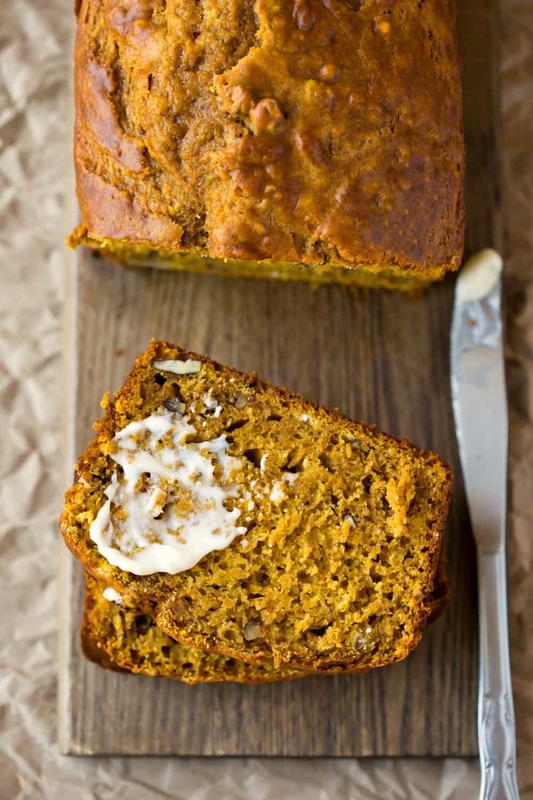 But this Buttermilk Pumpkin Spice Bread is too good not to share. I love pumpkin spice bread. I always have. I don’t remember there being pumpkin everything, and it being nearly the big deal that it is now, but I always looked forward to making pumpkin bread every fall. One of the things that I love most about pumpkin bread is how moist it is. I can’t say that I’m a fan of the cup (or more) of oil that most pumpkin breads have to make them so moist. Since pumpkin is already so great at making bread moist, I cut the oil and added buttermilk in for a super moist, super tasty loaf of pumpkin bread that won’t leave you with any heavy, greasiness. 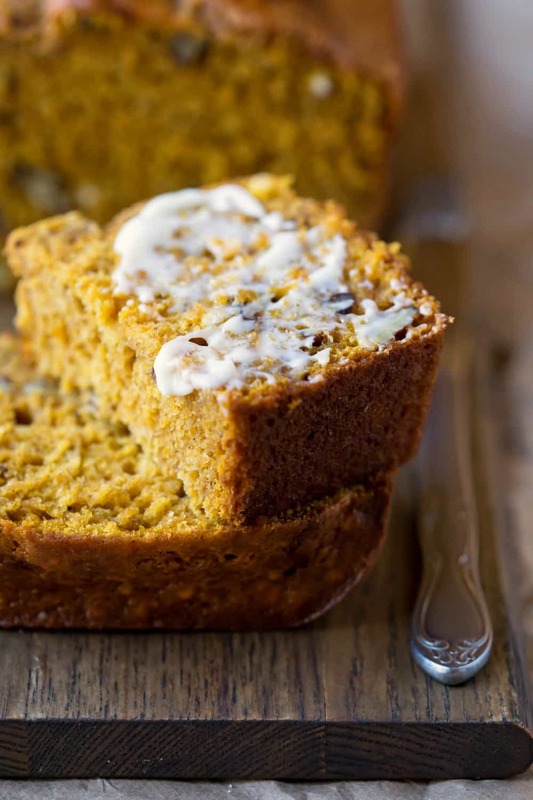 How long will pumpkin bread stay fresh? 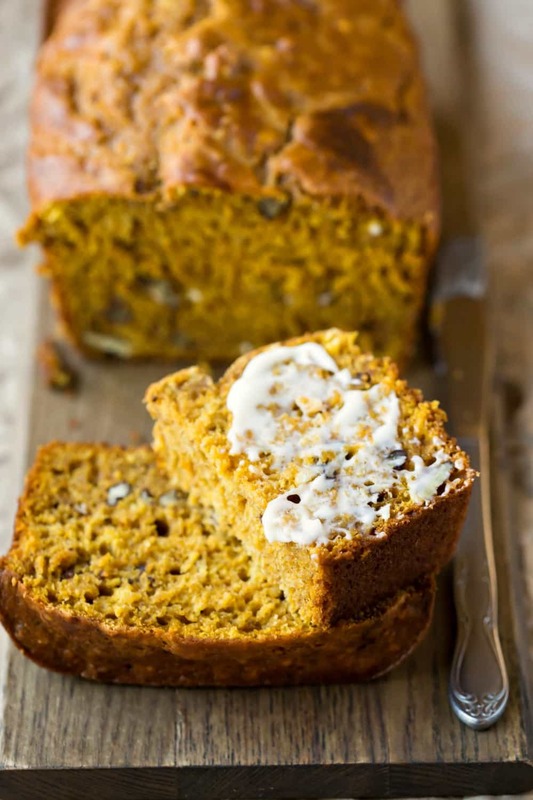 This pumpkin bread will stay fresh for two days store, covered, at room temperature. It will stay fresh another 1-2 days stored, covered, in the fridge. 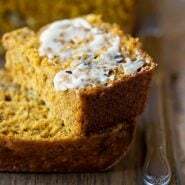 If you’ve tried this buttermilk pumpkin spice bread recipe, don’t forget to rate the recipe and leave me a comment below. I love to hear from people who’ve made my recipes! You can SUBSCRIBE to receive my latest recipe newsletters or FOLLOW ME on FACEBOOK, INSTAGRAM and PINTEREST for even more delicious food. Preheat oven to 350F. Grease and flour a 9x5-inch baking dish. Set aside. In a medium bowl, whisk together flour, sugar, baking soda, salt, and spices. Set aside. In a large bowl, stir together buttermilk, pumpkin puree, and oil until combined. Stir in eggs and vanilla until incorporated. Add dry ingredients, and stir until just combined. Stir in nuts if using. Bake for 55-65 minutes, or until a wooden toothpick inserted in the center comes out clean. Remove from oven, and let cool in pan for 10 minutes. I just don’t understand how online recipes work for others but not for me. I followed the recipe to the letter and thought – wow this is so much batter I bet it takes forever to cook through but others said this was a GREAT recipe. My hunch was correct…. lesson learned, again… trust my own sense of recipes. After an one and a half hours the darn thing was still gooey. Hi! I’m sorry to hear that! The amount of batter is standard for the size of the pan. So, there are usually two issues that will cause what you described. The first is using a smaller pan. If you used a 9×5 inch baking pan for the bread, then it’s usually the second issue – that your oven isn’t cooking at the correct temperature. Since you said that online recipes haven’t been working out for you, I’m guessing that your oven is the culprit. Was the middle gooey or was the entire bread gooey? I love pumpkin bread and this is the best I’ve made. The pumpkin flavor is perfect. Thank you for the recipe. I made this pumpkin bread, it was so good! The only problem was that I couldn’t stop eating it! I have the same problem! =) Glad you liked it. Thanks for coming back to comment! DELICIOUS. Breads need to be moist, and this one definitely is!